[ACT](VC): Legion20000 "Dragon Undead, Ghoul Dragon" (If your opponent's vanguard is grade 3 or greater, this unit may return four cards from your drop zone into your deck once, search your deck for the specified card, and Legion) [AUTO](VC):[Counter Blast (1) & Choose one of your rear-guards, and retire it] When this unit attacks a vanguard, if this unit is Legion, you may pay the cost. If you do, choose one card from your drop zone, and call it to (RC). [AUTO](VC):When this unit attacks a vanguard, if you have another unit in the center column, this unit gets [Power]+3000 until end of that battle. If WarLycan36 didn't turn up this week: He will be missed. Not by me, but he will be missed. Last card of the week is the second of the Granblue Legion units, Negrobolt. He legions with Dragon Undead, Ghoul Dragon, and for that, whenever he attacks, you Counterblast 1 to retire a rear-guard, and swap it with a new one. Oh yeah, and he gains 3k on attack, as long as you have another unit in the centre. ...I can't really get into it. Most likely because it's bland, not because it's BAD. At first glance, the capacity to not do much except get another attack with no new power on top sounds dull, but it's actually not a bad partner for Nightmist. If you happen to not have enough Samurai Spirits to swap into your revived Sea Strolling Banshees before they die again, this card can sack them away and get a new unit back on a 1:1 basis (efficient enough) and possibly chain skills on top of this (swapping Banshee for Banshee is permitted, take note). Without it however, riding it first is a somewhat poor fail condition. But if the method's effective enough, go ahead. Just don't expect me to use something I can't say is inherently stable. And finally, the card that both Saikyo and WarLycan have been waiting on, the Type 2 Legion of Granblue, Negrobolt. ...Seriously... Well, I suppose it can mean Black Bolt, but still, Bushi, kind of pushing it! Anyway, onto the review of Vanguard's version of Cthulhu. For one thing, I'm glad this is a rare, even if there's no SP version, because that makes the deck even cheaper. And for another thing, this is NOT a set-up card in the slightest. Well, it CAN be, but it's better used as a finisher instead of a set-up unit like Noir is. Point of fact, I do like set-up units like Fennel, Noir and Fianna, because, well, going for the kill shot all the time, unless you're using CEO Yggy or something like her, doesn't guarantee you a win at all. It's best to set yourself up for the best field possible and weaken your opponent's position before going for the kill shot. Then again, I'm an anomaly when it comes to playing Vanguard at times, so you can ignore that if you want to. This is a finisher card, you're supposed to bring it out when you've got a good position in play and can win either that turn or the next one. Anyway, when this has a unit in the same column as it, it gets +3000 when attacking, so a Deadly Spirit makes the Legion attack 30K. That Legion ability though... Yum! When you attack, you CB1, sac a rear guard, then revive a unit from your drop zone into play. Need a 4th attack? Done. Only have one booster for your rear guards? Fine, just sac it and move it to the other column. Want more cards in hand? Well, if you have a Dancing Cutlass or Sea Strolling Banshee in the drop, you can sac a rear guard and call them out. And, it should be noted, that if you do call them to R, their effects activate BEFORE you twin drive. If you're running this and not using pure Legion, run it with Cocytus R or Nightmist and hope you get Brutal Shade and one of the Limit Break units before you ride this one out. And, to be honest, that's not really that good. Maybe it works better than I think it does, but I'm not certain. The only Legion + Break Ride I've seen to work really well is Spike Brothers, but that's an all-or-nothing deck anyway. ...Well, there *IS* one more, but that's because I'm an anomaly and most people don't run it anyway. 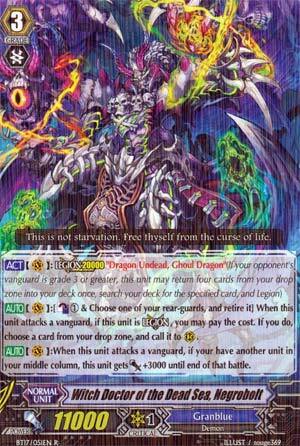 It's kind of why Infinite Zero Dragon will work with Link Joker Legions, but it's not too feasible at times. Again, I'm not certain that Necrobolt and Nightmist/Cocytus R is a good combo, but if you can make it work, all the more power to you. For me, I'm running pure Legion Granblue, sorry Warlycan. Argh, I made comparisons between units of one clan to another. I hate that, even if I think it was accurate. Sorry everyone, I'll try to not do that in the future. Again, as I said, comparing one clan to another isn't fair since each clan has their own way of doing things. But, hey, despite everything else, this is a solid boss for Granblue. Not sure if its better than Nightsnow with Limit Breaks. But it is a must-run card for Granblue if you're not using Nightsnow. I think... Oh yeah, the mate, well, if you revive the mate from the drop zone, it gets an ability to retire an opponent's rear guard if it hits the vanguard that turn. ...Yeah, that's not that great, nice for some pressure, but not that great. Pinot Blanc is better for Granblue overall. See you next week, I'm pretty sure we're covering Kagero next week, just depends on the order. [AUTO](VC):[Counter Blast (1) & Choose one of your rear-guards, and retire it] When this unit attacks a vanguard, if this unit is Legion, you may pay the cost. If you do, choose one card from your drop zone, and call it to (RC). [AUTO](VC):When this unit attacks a vanguard, if you have another unit in the center column, this unit gets [Power]+3000 until end of that battle. ...as of right now, this with Cocytus R and Brutal Shade is my current Granblue build, and boy, did I need Negrobolt now more than ever! Negrobolt's Legion effect is definitely the superior of the two (the other being Noir) as you Counterblast 1 and sacrifice a unit to resurrect another unit from your Drop Zone. This is pretty awesome as it essentially gives Granblue a sure fire fourth attack, and combining this with the Mate, Ghoul Dragon, adds a lot more needed pressure that the clan was lacking. Also, pulling off Negrobolt's point boost is easier and less costly as Noir, so there's that as well. Overall, if you want to Legion, use Negrobolt...you won't regret it.